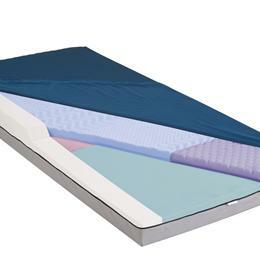 Medline Advantage "Select" Se Mattress, 36" X 84" X 6", Fb - Provides Excellent Pressure And Shear Reduction At An Economical Price. Surface Sculpted Top Layer Provides Pressure Redistribution While Creating Airflow To Reduce Heat And Moisture Buildup. Special Convoluted Heel Section. Nylex Top Fabric Combines Durability, Performance And Reduces Shear. Fluid Proof And Antimicrobial. Meets Federal Fire Standard 16 Cfr 1633. 350 Pound Weight Capacity.